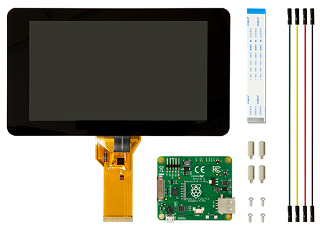 The people at Raspberrypi came out with their own touch screen display last week. I picked one up to play with for the following reasons. 1) As an official product so I expect 100% support from most if not all OS distributions. 2) It doesn't use the HDMI port on the Pi. 4) Low power, I can use the same wall charger for both the screen and Pi. I got the kit from MCM because they are a local company and shipping was cheaper than other resellers. The unit is very nice. Assembly was easy enough following the video here. I do need to fabricate some brackets to mount it or better stand it up. The only down side so far is the 800x480 resolution. If I design a touch interface this will not be an issue, but for a full desktop it is a tad cumbersome. As with most posts time will dictate if/when I get to continue tinkering with this.